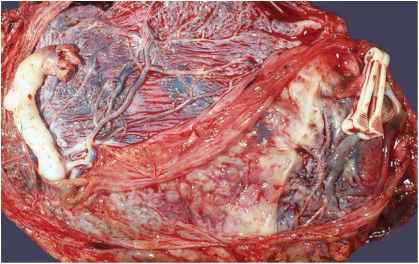 Today in the United States, at least one in 100 births is a multiple gestation and the examination of these placentas is one of the most important aspects of gross placental pathology. Twins account for a disproportionate percentage of perinatal morbidity and mortality and have significantly higher rates than singletons. Placentas of multiple gestations demonstrate all the abnormalities seen in singletons, as well as their own special pathology. While most of the following discussion relates to twins, the same principles are used when evaluating triplet and quadruplet placentas. Multiple births have become more common with assisted reproductive techniques, but refinements of procedure have fortunately decreased the number of higher order births currently conceived. Special twin placenta report forms are useful in examination (Appendix A-2). Determining the chorionicity of a twin placenta is the most important step in its examination (Figure 6.1). "Dichorionic" means two placentas have formed, while "monochorionic" indicates a single shared placenta. Any gestation arising from two separate fertilized eggs will be dichori-onic, as each conception forms its own placenta with all its components. These placentas may be totally separate; however limitations of space in the uterus frequently lead to "fusion" and a single disk. For practical purposes, there is no connection of the circulations in such placentas. Monochorionic placentas occur only in monozygotic or "identical" twins. The fertilized egg splits early in gestation and each portion continues to develop separately. Splits occurring before three days of development, while all the cells of the conceptus are still undifferentiated, lead to gestations with totally separate placentas. At about three days, some cells become developmentally committed as trophoblast and can no longer split. This leads to two separate embryos and amnions developing within a single chorion. Later splits are unusual and lead to twins in a single amniotic sac (monoamnionic) and finally conjoined twins. Figure 6.1. Diagrammatic views of the types of fused twin placentas with two amniotic sacs. "T" sections are taken from the point where the dividing membranes meet the fetal surface. 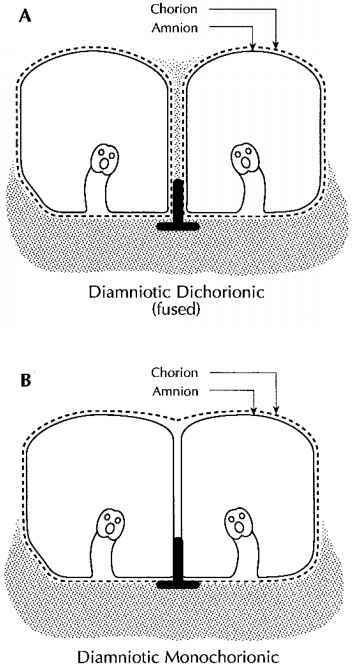 (A) The dichorionic placenta has two sacs each enclosed by amnion and chorion. There is chorionic tissue (stipples) in the dividing membranes, forming a ridge on the surface. (B) The monochorionic placenta shows no chorionic material in the dividing membranes and the chorion forms a continuous plate on the surface of the placenta. The dividing membranes consist of only two amnions. Two-thirds of monozygotic twins are monochorionic, and the remainder dichorionic. Like-sexed monozygotic dichorionic twins cannot be differentiated from like-sexed dizygotic dichorionic twins by placental exam. Only genetic testing will definitively distinguish them. In the United States at least 80% of like-sexed dichorionic twins are dizygotic, based on the incidence of twin types. The incidence of monozygotic twins had been constant throughout the world at about 1/300 births. Assisted reproductive techniques have been found to double the rate of monozygotic twins. The incidence of dizygotic twins is quite variable in different populations around the world and this is the type of twinning that is familial. Figure 6.2. This near term dichorionic twin placenta has two separate disks connected by membranes. A draped piece of thick, dividing membranes can be seen between the cords. Note there is fresh meconium on the dividing membranes on the side with two clamps. Figure 6.3. This placenta has two separate disks. There has been unequal chorionic "fusion" and the dividing membranes meet the fetal surface overlying the placenta of A with 1 clamp. Such lines are common on the surface of dichorionic placentas. These placentas can be manually separated with some superficial disruption. Figure 6.4. 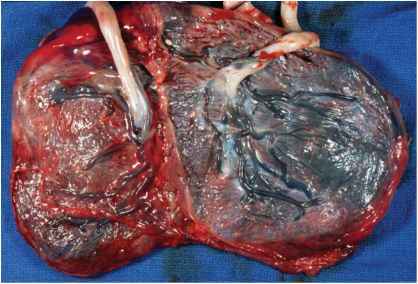 This dichorionic placenta has a "fused" disk.The dividing membranes have been largely removed. 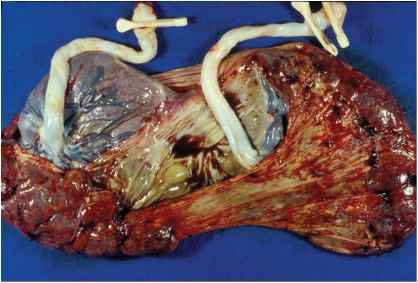 Note the ridge of chorionic tissue between the cords where the membranes had met the surface, diagnostic of a dichorionic placenta. Separation of the two placentas occurs along this ridge, and can usually be done with traction on each side. The vessels of these placentas do not connect. Note the yolk sac remnant at 12 o'clock. membranes by separating the layers, the surface will be disrupted and the placentas will separate. In contrast, monochorionic placentas have nearly transparent membranes and are easily removed leaving a continuous monochorionic plate. No ridge is seen (Figure 6.5, Figure 6.6). Chorionicity can be histologically confirmed in two ways. "T" sections include dividing membranes at a point where they reach the placental surface (Figure 6.1). Such sections are readily made on fixed dichorionic placentas; however in monochorionic ones it is difficult to keep the amnions intact. A roll of the dividing membranes can be made similar to what is done with the peripheral membranes. The dividing membrane is composed of 3 to 4 layers in dichorionic twins, and only two layers in monochorionic placentas (Figure 6.7). Figure 6.5. 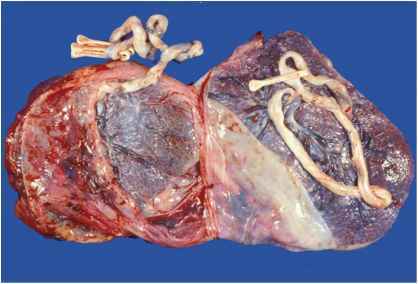 The extremely thin and delicate dividing membranes are folded on the surface of this monochorionic placenta. Note how little substance they have compared to those is Figure 6.2. Vessels dispersing from the cords can be seen to have complicated connections (arrow). 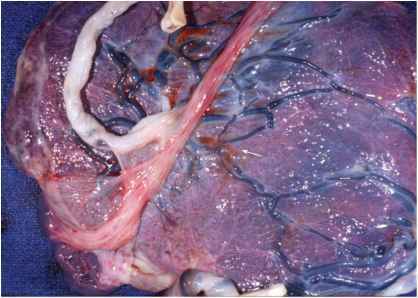 In humans, only monochorionic placentas have vascular anastomoses. One cord shows a web to the dividing membranes (arrowheads). Figure 6.6. The dividing membranes of a monochorionic placenta can be readily separated, leaving a smooth, continuous chorionic surface between the two cord insertions. This triplet placenta had three amnions and 2 chorions. The amnions have been removed leaving a continuous plate between the monochoronic set and a ridge to the dichorionic triplet (upper right). In sectioning the dividing membranes in higher multiples, there may be several rolls made. A consistent means of submitting these should be adopted, such as A-B in A, B-C in B, and C-A in C.
Figure 6.7. 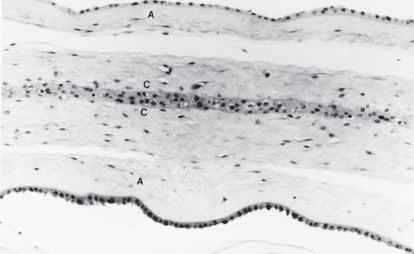 (A) Microscopic view of dividing membranes in a roll from a dichori-onic twin gestation shows they are composed of amnion from each twin containing epithelial cells and attached connective tissue (A) and chorion from each in which the two chorionic layers may fuse (C). 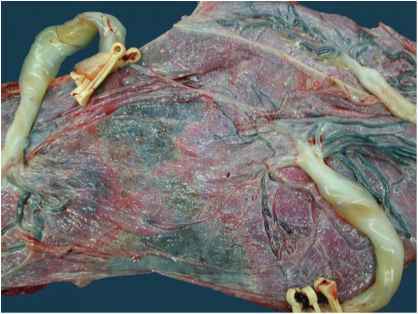 Any chorionic tissue in the dividing membranes indicates a dichorionic placenta. Do seperate disc twin placentas have a dividing membrane?